Rotterdam is certainly not the first city you would think of to spend a week-end. And yet – this port city and modern architecture treasure is bursting with creativity. People in Rotterdam like to say that they are “doers” when the one in Amsterdam are “talkers”. And you’d have no pain to believe them when you see all the creative initiatives that come from this 600,000 people city. A bit out off the beaten path but well worth the trip, Aloha is Rotterdam’s very own beach resort. The people of Picknick – another gem on the Mariniersweg in the city center – took this old swimming pool and transformed it into a tropical hangout. Dancing, small events, theatre shows – everything is possible in this place. The outside pool is located on a spacious riverside terrace with an amazing view. They currently grow mushrooms here as well… but not the magic kind. Supermarkets are so 2009. Located close to the famous Hotel New York, Fenix Food Factory is where you go to get all your goods these days. Locals have filled this old waterfront warehouse with regional products: artisan bread prepared by Jordy’s bakery, vegetables, cheeses, meats, and a great craft beer brewed by De Kaapse Brouwers, which has its headquarters in the Fenix Food Factory (they have almost 20 beers on tap, including their own). Take a seat to enjoy some of these tasty morsels – or take the seat home with you, as every piece of furniture is for sale! 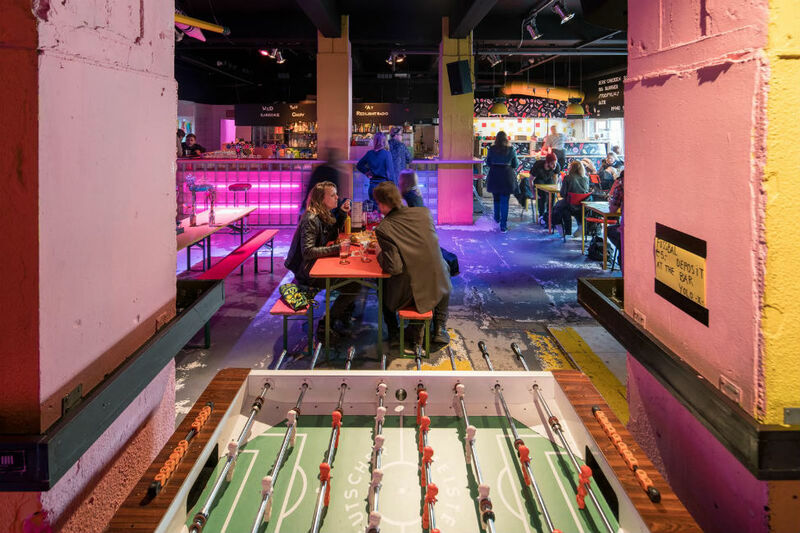 If you’re looking for a bit more fun and games, BAR has a ping pong table, fussball, and a selection of board games. On top of it all, they’ve also got a Mediterranean grill serving up Greek-style octopus, halloumi, and falafel. An adventure starts at BAR. There really is nothing like WORM. Hidden in a basement on one of Rotterdam’s busiest nightlife streets, this venue will amaze you with its varied and diverse program. Never a place for the big names but firmly rooted in the underground, expect punk, electro, grime or noise – no genre is frowned upon. Besides music, WORM is home to a quality cinema that shows rare finds and cult favorites. The foyer also features Cult Videotheek, where you can rent forgotten VHS and DVDs from staff who are always on-hand to point you in the direction of strange zombie movies or blaxploitation must-sees. Once you’ve experienced it all, you can take a seat in a place at the front they call the Wunderbar – a bit German, a bit weird, but very open. This shop lies at the heart of the city’s vinyl hotspot, and just around the corner you’ll also find Vinylspot, De Plaatboef, Velvet Music and other great record stores. But Demonfuzz should be your starting point. This place is run by DJs, so everything is done with a certain amount of detail. They keep a photo diary of all the greats that have visited the shop and are more than happy to help out if you’re looking for something special – in fact they might even take you to the huge archives in the back! Discover more alternative and cultural spots in Rotterdam with our city guide Indie Guides Rotterdam.